I mentioned in my previous post about this year’s vegetable garden that I used seed tape from Jung Seed for the first time — and, for the first time, I got lettuce seeds to germinate in my garden. 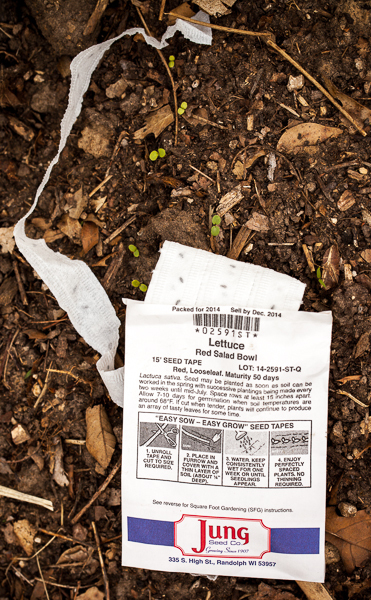 Seed tape alongside the tiny lettuce sprouts from the seeds I planted a week or so earlier. Photo taken late April. If I were growing lettuce to sell, that probably is a good density. I would hack all the plants off at the base about now and consider it done. But the way I like to use greens in my garden is to harvest the outer leaves and let the plant continue to grow so I can harvest more later — cut and come again. So, after I took the above picture, I took out every other plant and made salads from them for a couple of days. I mulched with leaf mold around the remaining plants to keep the weeds at bay. I harvested enough of the outer leaves, along with some baby chard and cress, to make three big salads — Rick and I had salad with dinner and I gave the rest to a friend. I’m very pleased with my first successful lettuce crop! Beth Fish Reads hosts Weekend Cooking, a weekly blog hop of food posts. Saturday Snapshots are hosted each week by Melinda of West Metro Mommy Reads. Check out her post this weekend for lots of great photos around the web. How exciting. What lovely lettuces :). I imagine those fresh salads were wonderful. The really are tasty salads. It always takes me a bit by surprise how delicious lettuce can be. I bought a little potted lettuce garden last year. This morning my husband asked me if I had bought another one. We really enjoyed it. Considering I have a small strawberry garden right now, I think I should just try planting seeds there instead of getting a container garden. How neat! I would love to grow my own produce like that. I’m moving to the middle of the desert though, so this is probably no longer viable. 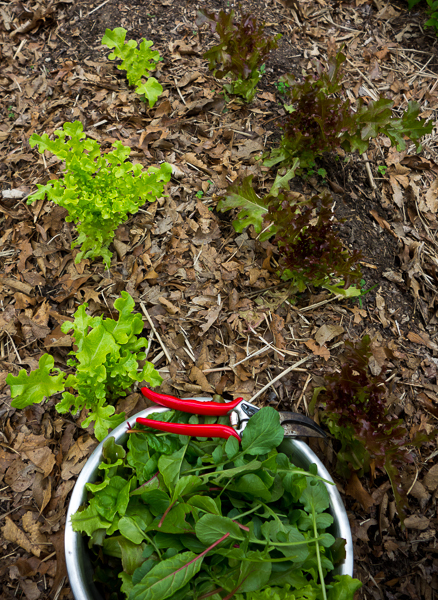 There’s nothing so good as tender, homegrown spring lettuce. Congratulations on such a fine crop. FABULOUS! Thanks for sharing such beautiful pictures. I am passing this along to Rob. Very good to know. Thanks. There’s nothing like crisp fresh vegetables from your own garden. Looks like your seed tape experiment is a big success. My yard doesn’t have enough hours of sunlight to successfully grow many vegetables. Luckily, my daughter-in-law is an accomplished gardener and shares her bounty with my husband and me. I’m looking forward to juicy home-grown tomatoes soon. My Saturday Snapshot post features WALLA WALLA, WA. I’ll bet that was one of the most delicious salads you’ve ever had! It was! It required nothing but a simple dressing. Congratulations Joy!! You’re garden is doing great! I sure wish I could have one, but I’d have to design a raised garden and buy the lumber and dirt because our yard is mostly sand. What a lovely crop, the seed tape idea sounds like its a winner! Wow–it’s a sustainable salad bar! I love the idea. It’s far too hot to grow greens here in Florida, but that seed tape makes it seem too easy. Enjoy! Very cool the tape worked. 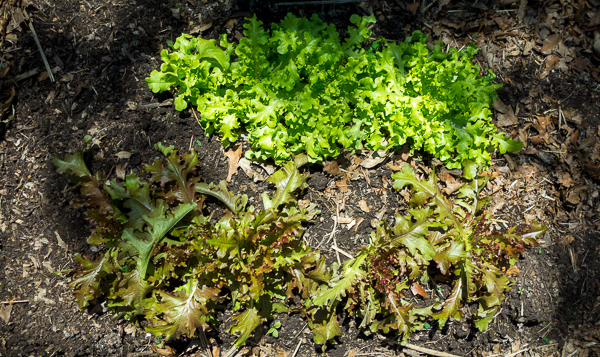 I use starter plants and then usually plant more starter plants if I can find them after the Fourth of July for all summer lettuce. It is so great to have it fresh from the garden isn’t it? That’s a fabulous looking crop of lettuces. I’ve used seed tape for growing herbs before with quite good success. I don’t think I’ve ever seen seed tape in Australia, which looks to be a sad thing. Congratulations on your gardening success! Your harvest looks sensational. I can only imagine how delicious it was.